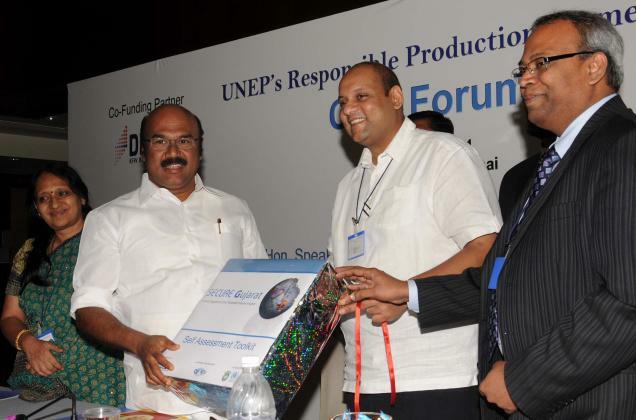 (ASSIST event featured in The Hindu, August 26, 2011) – The ‘responsible production framework’ evolved under the United Nations Environmental Programme will be of immense help to micro, small and medium enterprises (MSMEs) in Tamil Nadu, Speaker of the Tamil Nadu Legislative Assembly D. Jayakumar said here on Thursday. Tamil Nadu being the hub of MSMEs with more than 15 per cent of such units in the country, it was imperative to increase their awareness on “environment” and “sustainability,” he said. Mr. Jayakumar was addressing the CEOs’ Forum convened by the Asia Society for Social Improvement and Sustainable Transformation (ASSIST), a non-governmental organisation, in association with Madras Chamber of Commerce and Industry. He said that there was pressure on MSMEs to realise the terms “green” and “safe.” Climate change was a reality and that should be taken seriously. Similarly, safer production, awareness and preparedness at the local level were also essential. As it would be very difficult for such small units to learn correct practices on their own, the UNEP’s initiative, which had brought out the best in terms of safety and sustainability, would be helpful. As Chief Minister Jayalalithaa was well aware of the importance of environmental protection, she had imposed a ban on plastic carry-bags of less than 60 microns. Besides, she had granted an interest free loan of Rs.200 crore to the dyeing units at Tirupur in a bid to combat pollution. Pointing out that Ms. Jayalalithaa was determined to make Tamil Nadu a “global hub” for automobile and automobile ancillaries manufacturing, he said she was evolving a strategy to attract more and more Foreign Direct Investment.